Our names are Rebekah and Laura and we are delighted to be running Talking Tots classes in South West London. As mums of toddlers ourselves, we feel very strongly that it is important for children to have as many different experiences as possible, to enable them to develop socially. A key part of this is being able to communicate effectively, to listen and pay attention when needed and to have the self-confidence to make the most of any learning opportunity. These skills are vital for when our little ones eventually start school. 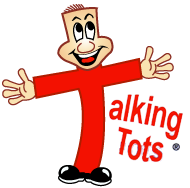 Talking Tots is something that we both feel passionate about and love the fact that the class activities have been structured by experts and offer something unique and educational. At the same time, they provide a welcoming, fun, interactive and social environment. Our classes are a great opportunity for you and your child to come along and have some fun. Along the way, you'll learn how to develop your child's communicationn skills and confidence. The classes are open to children aged 4 months and over, whether they're just starting babbling, or they're already a fully-fledged chatterbox. We thoroughly enjoy running the classes and really hope you enjoy the classes as much as we do!